In version 5.1 and above, filters created for browsing documents are also applicable when browsing code by namespace and class. In addition, class and namespace filters now apply to document browsing. At any level below Home, click on the left-hand pane of the GUI. Create a Name and a Description (optional). Type - Module, Namespace, Class, Method, Attribute, Document Path, Method Branch Coverage, Method Sequence Point Coverage, Method Complexity Percentage and Method CRAP Score. 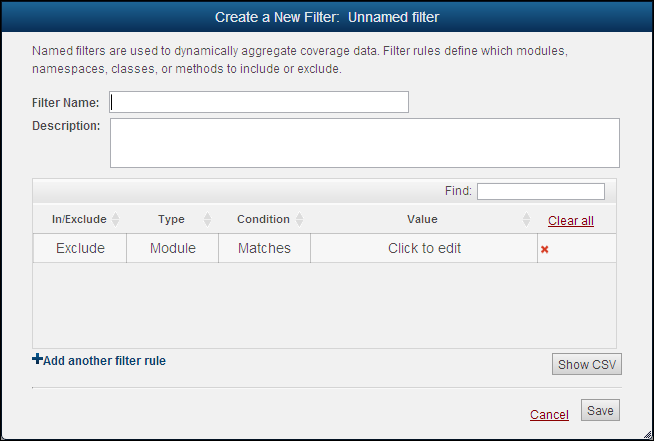 After your filter is saved, a notification will appear in the GUI to remind you that the coverage data you're viewing is being filtered. The filter notification also allows you to easily remove the post-coverage filter by clicking on it.